Genesis Gym aims to be the best gym in Singapore by offering you the maximum health and fitness results possible in the time you spend with us. Our holistic training system gives you the best in exercise, nutrition, injury management, posture correction and more. For nearly a decade, we’ve produced consistently excellent results for a wide variety of clients ranging from former “couch potatoes” to busy executives, fitness buffs, senior citizens with nagging aches, and national athletes from rock climbing, tennis, basketball, rugby, floor ball and cricket teams. Over the years, we’ve developed a unique system that will provide you with a safe, science-based training programme customised to your specific needs. When you join us, you’ll get personal training from our team of coaches. This means you’ll have a flexible training schedule and will benefit from the up-to-date knowledge and expertise of the entire team. At the same time, you’ll maintain the consistency in your training regimen because of your individualised programme. To be the best gym in Singapore we need to constantly learn more to help you more. Our team believes in scientifically backed research and continual education. That’s how we can always provide you with no-nonsense, top-notch techniques to help you achieve the results you want. We know you’re busy, so we do all the health and fitness research for you. The Genesis team takes great pride in bringing you the most up-to-date information so that we can give you the best possible advice. We help you distinguish genuine information from all the commercially driven false advertising out there. Our training academy spends a six-figure sum on education annually and provides our team of personal trainers with world-class knowledge in the areas of exercise, nutrition, injury management, rehab, posture correction, coaching skills, professional ethics and more. This elite level of knowledge is unmatched anywhere in the world and is one of the main reasons for our clients’ success. Our master coach, Jonathan Wong, alone has spent more than 15,000 hours and hundreds of thousands of dollars on industry-specific education to help our clients maximize their results. This includes studies in holistic medicine, anatomy, neurology and sports performance. When you join our gym, this huge (and constantly growing) reservoir of knowledge and experience will become available to you through our coaching system. When you sign up for personal training in any other gym or with any individual trainer, you will only benefit from the experience and technical knowledge of your specific personal trainer. This trainer may even be assigned to you at random. Your results are a gamble because they depend on how much knowledge that personal trainer has, how much he cares about his clients, and how much effort he puts into upgrading his skills. At Genesis Gym Singapore, we consolidate everything our entire team knows into a unique, personalized programme just for you. As such, you get the benefit of our collective experience, plus the support of a team of personal trainers who are committed to your success. Joining Genesis Gym means you will have the highest levels of exercise technique, training program design, nutrition, injury prevention, posture correction and holistic health at your disposal. We even team up with trusted medical professionals who can provide medical imaging and lab testing, just in case this is necessary. This complete team is unmatched by any fitness center or gym in Asia. And we offer it all so you can achieve the results you want in the safest, most efficient way possible. Another problem with other gyms in Singapore is that you need to fit your sessions into the available time slot of the personal trainer assigned to you. This is a huge inconvenience when you have a busy schedule and your personal trainer’s schedule doesn’t fit yours. Our team training approach allows for a flexible schedule to match your busy lifestyle. This provides far more consistency and availability than any other Singapore gym. Consistent training means consistent results. It’s possible to damage your long-term health in the pursuit of lean abs, muscular arms or weight loss. Low-calorie diets, excessive exercise, insufficient recovery periods, unproven supplements, stimulant abuse, steroid use and unsafe exercises are common in the “health and fitness” industry—but they will never be used in your Genesis-designed training and nutrition plans. We believe that it’s meaningless to have a perfect physique if you’ve got terrible bone, heart and blood health. At Genesis Gym, we’ll ensure that your “inside” health matches your “outside” appearance. Knowledge alone doesn’t lead to results—true caring adds that vital spark. Our Singapore personal trainers are not just selected by how fit they are or how much they know. A key selection criteria is how much they care about others. After all, it’s pointless to have the most knowledgeable trainer in the world if he or she doesn’t care about helping you. Our team is completely focused on your needs, as well as your health and fitness goals. And it’s not just our personal training team. Our close-knit community of members cheers each other on as we train together and lead healthy lives. Many of our clients have been with us for years, and have referred their friends and family members to join our community. We’re proud of this. The Genesis Gym story started in 1999 with Coach Jon’s passion and drive. He had a vision to bring world-class health and fitness services to Singapore. Accomplishing this has been a 16-year journey of making a difference in the lives of thousands of clients. “I started Genesis Gym because, at that time, there was no gym in Singapore whose philosophy was based on giving clients the best possible results in their health and fitness. “All other gyms did things based on the latest fads or the easiest—or most profitable—business model. Our first training centre had humble beginnings, with a 700-sq-foot location (about the size of two big bedrooms) in River Valley. Word of our unique services and our clients’ outstanding results spread, and our client base grew quickly. To accommodate the needs of our clients, we moved into a much larger 3,000-sq-foot location at Aljunied in 2009. We moved to the next level by developing a 4,200-sq-foot location in Mountbatten, which was the biggest and best-equipped private gym in Singapore. Today, our headquarters are based in a 5,600-sq-foot location at Paya Lebar. 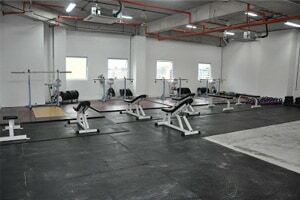 It remains the biggest and best-equipped private gym in Singapore with world-class facilities and personal trainers. In addition we have opened two more branches at Raffles Place and Alexandra Road to help people around Singapore have more convenient access to our personal training programmes. Genesis story is about our clients. While training our team and opening new fitness centres is exciting, we always make sure that you come first. Because, more than anything, the Genesis story is about our clients. If you want to get the best fitness results from a safe, customised and science-based training system, we invite you to be part of our story.